By the end of the year, Romanian railway infrastructure manager CFR SA will receive another two railway sections of Corridor IV, the northern branch. These sections are Sighisoara – Atel and Atel – Micasasa with a length of 55 km. FCC Construcción announced the finalisation of works on these two sections of the project “Rehabilitation of Brasov-Simeria railway, a component of the pan-European Corridor IV for the traffic of trains at a maximum speed of 160 km/h”. In April 2018, CFR SA announced that, by the end of the year, it would open the traffic on almost 140 km of railways upgraded for speeds up to 160 km/h. The two sections are part of the 140 km to be put into operation. Also, in the same month, CFR SA estimated that railway infrastructure and superstructure modernisations works on 136.35 km, between Sighişoara and Simeria, would be completed. Therefore, CFR SA is in full commissioning process for another section, Coslariu – Micasasa, with a length of 36.6 km. The contract for the modernisation of Coslariu – Micasasa section is worth RON 721 million. The builder is Aktor-Arcada consortium, which includes Aktor Tehnical Societe Anonyme (Aktor S.A) and Arcada Company S.A. 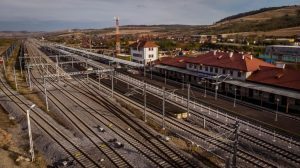 The Romanian railway infrastructure manager is also close to commission another section, Border – km 614, where civil engineering and infrastructure works are completed since 2016, and the deployment of ERTMS is now expected to be commissioned. 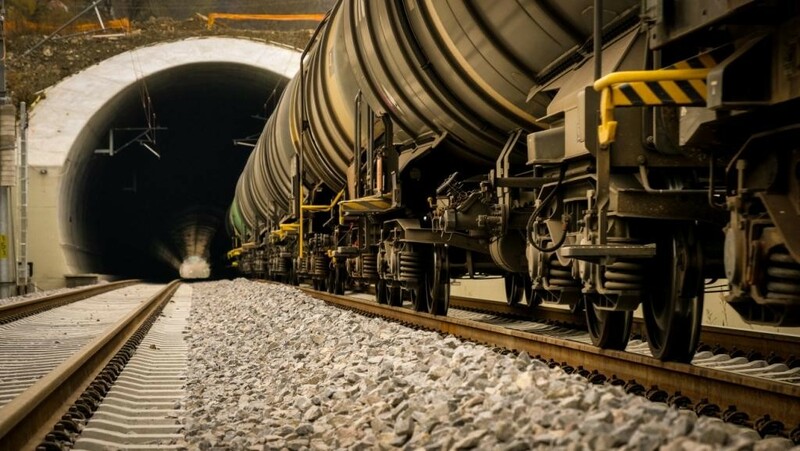 – the execution of a railway tunnel of 970 m – Danes Tunnel – characterised by different execution methods: artificial tunnel (Sighisoara entrance) with a length of 20 m, a 862-m long natural tunnel and artificial tunnel (Danes entrance) with a length of 87 m. This is the longest railway tunnel built in Romania after 1989 with European funds. 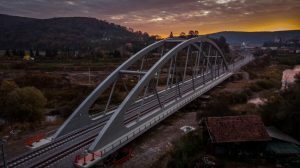 – the execution of 30 bridges of which 6 bridges with metal platform with openings varying between 45 m and 125 m.
– the execution of three overpasses with 6 openings, the central opening being of 75 m.
– relocation of main pipeline with a 6 m diameter. Overhead line modernisation works were carried out on 55 km of railway, as well as energy supply works and telecommunications works, such as relocation of optical fibre and passenger information systems (megaphones, information screens etc.) Energy supply works also include the rehabilitation of Dumbraveni si Micasasa Electric Traction Substations. 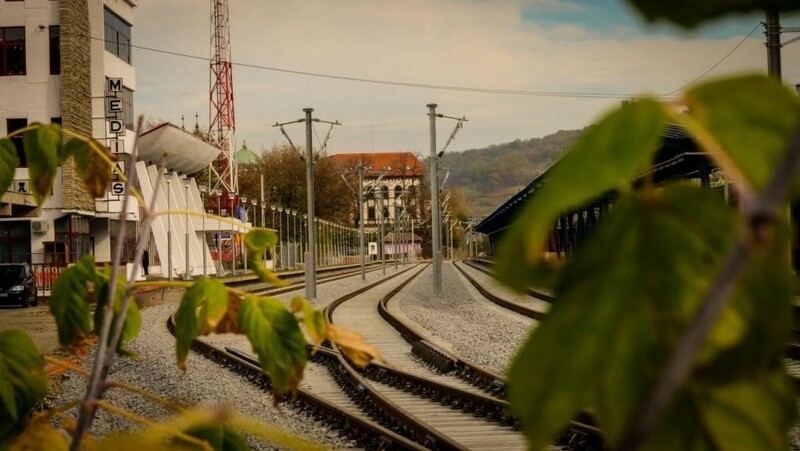 Currently, trains can reach speeds of 160 km/h between Sighisoara and Micasasa, except for the entrance in Sighisoara station where, according to the technical project, there is a speed limit of 65 km/h and the entrance in Medias station, where there is a speed limit of 120 km/h.